Kim Jaejoong has kicked off his first nationwide tour. On the 4th, Kim Jaejoong met with fans at the Busan BEXCO for his ‘2014 Kim Jaejoong 1st Album Asia Tour Concert in Busan’ concert. As expected of the first concert of the singer’s nationwide tour, the Busan concert was full of energy and power, with each song met with thunderous applause and cheer from fans. Kim Jaejoong opened his concert with energetic renditions of ‘9+1#’ and ‘Butterfly’, and moved on to sing ‘Rotten Love’, ‘Kiss B’ and ‘Light’. His melodious voice was the highlight of ballads such as ‘Now Is Good’ and ‘What Used To Be’, and was met with an explosive response. The details Kim Jaejoong put into the concert were the highlights of the show. 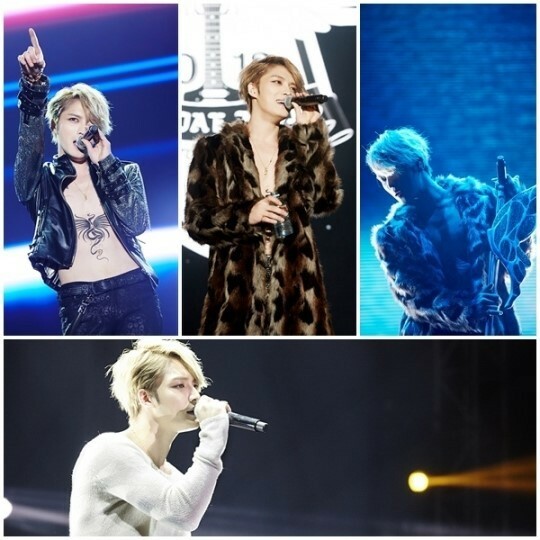 To commemorate the New Year, Kim Jaejoong changed all of his concert outfits, other than for his encore. He also created a different design for his standing microphone, catching the attention of all his fans. As it was the singer’s first solo concert in Busan, Kim Jaejoong’s concert was filled with families and lovers, as well as regular fans. A mother and daughter caught the attention of Kim Jaejoong and he held an on-the-spot interview with her, wishing the fan a happy birthday. Kim Jaejoong’s affection could be felt throughout the whole event. In the middle of his concert, Kim Jaejoong sang ‘I Have Nothing’, to the surprise of his fans. The beautiful melody and explosive high notes had fans on their feet, cheering the singer on. The atmosphere got more energetic as the performance went on. Kim Jaejoong expressed his joy as he said, “Busan fans are so passionate! Your passion is amazing! I love Busan!! I will come back, for sure.” He also made a few comments with a Busan dialect to the delight of his fans. Meanwhile, Kim Jaejoong will be performing in Gwangju on the 11th, and Seoul on the 25th and 26th of January.